Here’s a challenge to Australian politicians, leading food retailers like Woolworths and Coles and perhaps consumers: make sure that every child in the country has access to affordable fruit and vegetables by 2017, “whatever their postcode”. It was laid down last week by global health campaigner Alessandro Demaio who says Australia can’t address health inequity, nor its obesity emergency, when rural and remote communities have to pay $9 for six mushrooms or $4.50 for a small piece of broccoli. Poor diet, he said, was the biggest risk factor of disease worldwide and one that could “not be more evident” in rural and regional Australia. Addressing poor diet should not be about “blame or the lack of sound personal choices” but a much more complex political and economic understanding. “In short, when it comes to food and food production, we have a broken system,” he said. But how to make prices or access to affordable healthy food equitable? Should the Federal Government subsidise prices? Should major retailers be required/enticed to play a role? If so, would those of us who live in cities happily pay more at the checkout if it meant ensuring highly disadvantaged remote Aboriginal communities might be able to afford what we take for granted? And would that all work? One current study led by the Menzies School of Health may point the way. The Stores Healthy Options Project in Remote Indigenous Communities (SHOP@RIC) will test the impact on consumption of fruit and vegetables, diet drinks and water in 20 remote Northern Territory communities of a 20 per cent price discount alone, and then with an in-store education program. Demaio, a postdoctoral fellow in global health and non-communicable diseases at Harvard Medical School, recently made the case for action, noting several studies in Australia have highlighted the disparity in the cost of healthy food between urban and rural areas in South Australia, Queensland and the Northern Territory. He told the Lowitja conference prices for healthy foods in remote areas can be more than 50 per cent higher than the cheapest available in metropolitan stores. The study found that one-quarter of total food expenditure was spent on non-alcoholic beverages, with 15.6 per cent spent on sugar-sweetened soft drinks. As little as 2.2 per cent of money spent went on fruit, and only 5.4 per cent on vegetables. Sugars contributed between 25.7 per cent and 34.3 per cent of energy, of which 71 per cent was refined sugar and sugar-sweetened drinks. Further, white bread was a major source of energy and most nutrients in all three communities. O’Dea says there have been a number of international responses to similar issues, including a promising New Zealand trial. In Canada, a new food subsidy program called Nutrition North replaced a long-established Food Mail program. According to this report, the old program subsidised shipments of most foods and some hygiene products, while Nutrition North only covers healthy foods. A United States supplemental program for women, infants and children (known as WIC) provides vouchers for disadvantaged households to buy specific foods (including low fat milk and wholegrain bread and rice) and US insurance companies offer rewards for healthy eating. A study in a remote Northern Territory Aboriginal community found that food in general cost 50 per cent more than in Darwin, and that families spent an average of 38 per cent of their income on food and non-alcoholic beverages, compared with 14 per cent for the average Australian household and 30 per cent for low-income non-remote Australian households. However, she notes even the 20 per cent discount being trialled will still not come close to providing city prices for remote and, generally, significantly poorer households. “For low income people we need more than parity,” she said. Demaio, who is Melbourne born and raised, may be well known to Croakey readers and Twitter uses after his stint on @WePublicHealth last year. Last year he co-founded NCDFREE, a global social movement against non-communicable diseases, which raised $US60,000 through crowd-funding and made three short advocacy films, one in collaboration with the World Health Organisation. 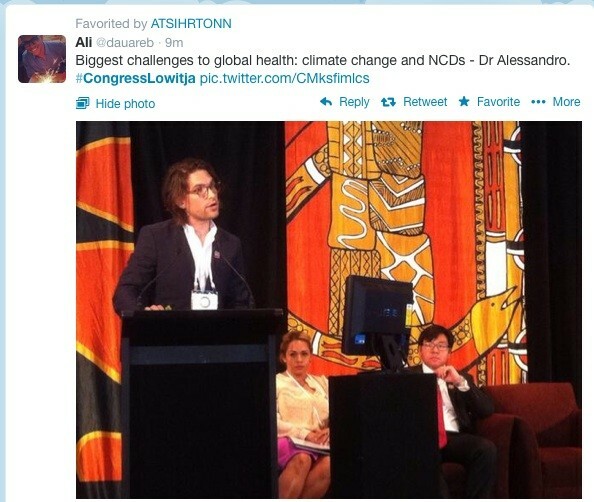 He told the conference climate change and non-communicable diseases were the biggest threats to global health – they also shared the same causative and mitigating factors, he said. • You can track the Congress Lowitja coverage here. Why aren’t governments tougher on private health insurers? The study only deals with bought food, and neglects any reference to home grown/traditional foods. Maybe the communities are growing their own fruit and vegetables and so don’t need to buy them. Either way, subsidies are not the answer. Group buying groups (to get better pricing) or an aboriginal wholesaler in remote communities (which would provide employment) would be a better solution. Not everything requires a handout from the government. For a start, it isn’t just about children, unless you want a mechanism that gives children affordable, healthy food while leaving the adults with unaffordable, unhealthy food. So the correct approach is to ensure that such food is available, in a way most likely to have them actually use it. In remoter areas, the first part of the solution actually seems fairly simple. Aboriginal general stores could be the dominant local supplier, thus having a major influence on the practices within a community by what they do and don’t stock and service. For example, Aboriginal Community Controlled Health Organisations provide food at meetings, community barbecues, group programmes and other community events. Aboriginal Health Workers are often seen as role models in their community and have the potential to be advocates for healthy lifestyle choices. Regular and reliable public transport is essential, which again an Aboriginal organisation and drivers are best placed to provide. One for the children – provide said healthy meals at school. In fact, all schools should provide breakfast. Due to both complacency and ideology, food security in Australia is deteriorating. As with many other problems, the warning signs are emerging amongst the disadvantaged and low income groups. Food insecurity arises for them through increasingly not having sufficient food, being unable to afford food when hungry; having a poor diet due to those limited food options; anxiety about the next meal; or having to rely on food relief. Naturally, our politicians and media are in denial. After claims emerged in late ’11 of Aborigines in the Anangu Pitjantjatjara Yankunytjatjara lands starving because they cannot afford to buy food, Mal Brough, the architect of the Northern Territory intervention, blamed the Rann and Gillard governments for failing to force them to have welfare reforms and quarantining. He thus diverted the issue to suit his political agenda – though obviously the assumption inherent in his approach worked against any effective solution. On the contrary, perhaps we should DENY them access to food, any food between meals. And if the kids are fat, empty the frig of carbs. Chuck out all the dairy products, all the fruit juices and anything made with flour. Especially anything labelled with “natural goodness”. We take this “healthy food” business too far. If the kids aren’t fat and don’t have scurvy, they’re doing fine. Where the water is available, the best solution is for people to grow their own fruit, and we should do a lot more to encourage them to do so. But that’s only half the solution, and won’t be much use in many desert communities. We also need better roads so that the produce that doesn’t grow there can be trucked in more cheaply.